If you have a HomeGroup established, you might want to share a new folder with the group. 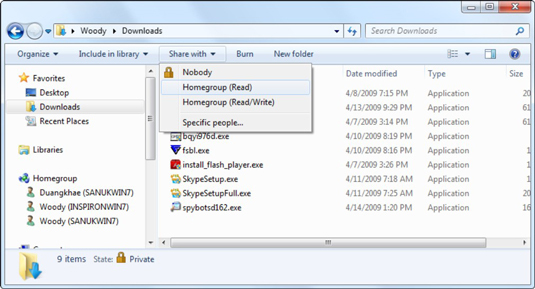 Windows 7 makes it easy to add folders to your HomeGroup. In fact, it’s much easier to add folders to a HomeGroup than it is to add them to a regular network. There are three ways you can add folders to your HomeGroup. If you want to make a folder available to everyone in your HomeGroup, the simplest approach is to add it to one of your shared libraries. Anybody attached to the HomeGroup will be able to open and read the items. Just open the library, click the Includes box, click Add, and then select the folder you want to add. You can add the folder to your Public Documents folder to allow everyone in the HomeGroup to read, modify, or delete the items in the folder. Just locate the folder in Windows Explorer and drag it to the Public Documents folder. Navigate to the folder you want to put in the HomeGroup. Chose Start→Computer and then locate the folder you want to share. On the menu bar, click the Share With button and choose how you want the folder shared. Choose HomeGroup (Read) to give everyone in your HomeGroup read access to the files. Choose HomeGroup (Read/Write) only if you trust everyone not to delete or otherwise clobber the files. Go to the HomeGroup window and view the available libraries and folders. It can take a few minutes, but eventually the shared folder becomes available all across the HomeGroup.